The trucking industry is very “green”. Not green like environmental green. Green like greenback green. Though we think fondly of the trucking lore and traditions at the driver-level, at the executive level every decision is dollar-driven, especially with the larger transportation businesses and retailers with self-contained distribution and shipping branches. No stone un-turned for improving Return-On-Investment. Everything scheduled to the minute and the mile. Pickups. Deliveries. Maintenance. Equipment replacement. Right down to the cost of a cup of coffee. We still see some heavily-chromed semi-trucks on the road with girlie-mud flaps and tall polished vertical exhaust stacks. But, for the big fleet operations like Walmart, UPS, XPS Logistics, and Knight it’s all about squeezing out that last cost-effective cent of fuel efficiency and preventing that unplanned- repair-based delivery delay. Cabs with full air dams and fairings and van trailers with belly skirts. Hidden horizontal exhausts. Real-time OTA equipment monitoring and optimized maintenance schedules. Low rolling-resistance tires everywhere. 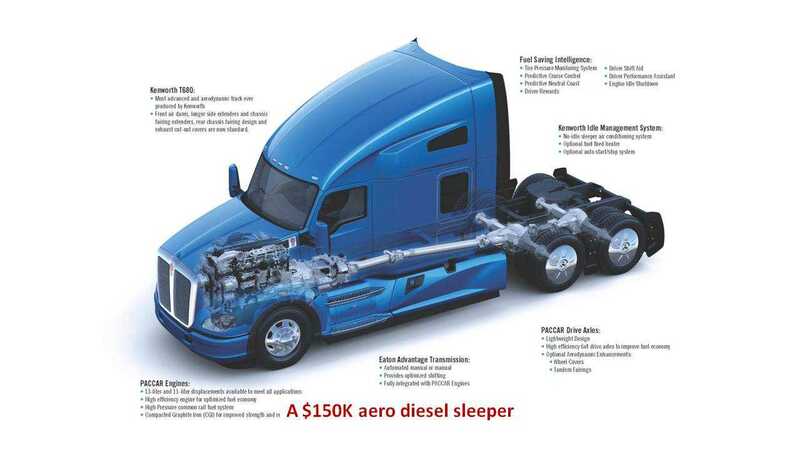 Diesel engines with 40% thermal efficiency. Instead of the 6 mpg average of just a few years ago, the new rigs are now are getting 8.5 mpg. Not driven by CAFE standards but by accounting standards. 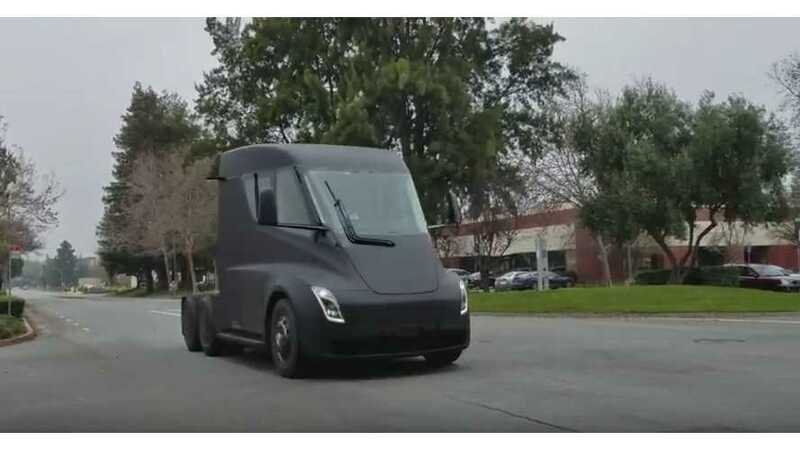 So, when Tesla rolled out the new electric semi-concept that offers low energy costs, premium performance, AND simplified maintenance, “starting at $180K,” the green eyeshades went-on and the accounting calculator key-taps flew. And then the pre-order reservations poured in. Not because Tesla spelled “S3XY” but because it spelled $PROFIT – if the production-version price matches their claims. 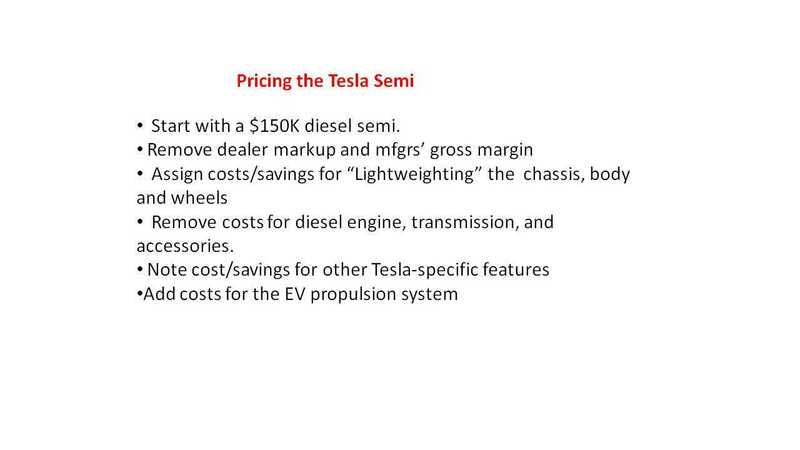 Estimating the cost of the Tesla Semi from-scratch would be a daunting task so we made a significant simplifying assumption: The Tesla Semi “glider” without the electric propulsion system will be similar in construction and cost to a current-generation lightweighted Class 8 diesel tractor “glider” without diesel engine and required accessories. Like seemingly everything else in the world, many new current-generation Class 8 tractors for sale are advertised online, with complete specs and prices. As well are the replacement components, including engines, transmissions, axles, tanks, etc. 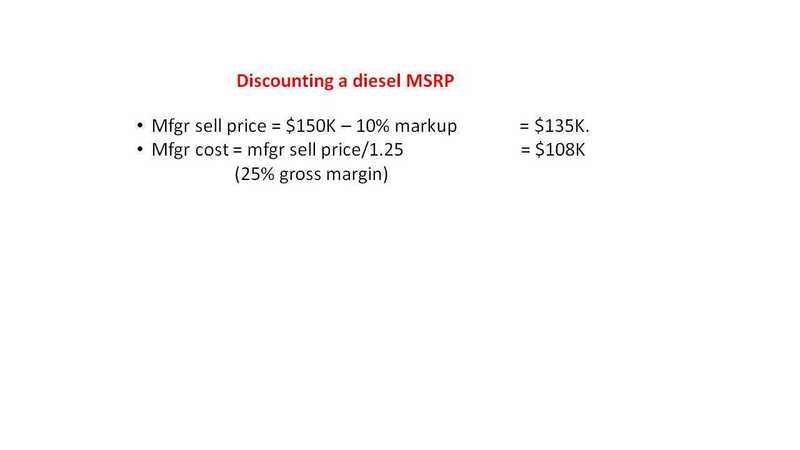 Truck buyers sites tell us expected dealer markup embedded in the asking prices. And with some costs, we just have to make a “scientific” WAG based on what appears reasonable. Note we used a diesel “sleeper” as our starting point but the Tesla Semi is a “day cab.” Most diesels with the high-end aero configurations matching Tesla’s features are sleeper units and provided the best asking-price information. For the electric propulsion system, the biggest single cost is the battery pack. 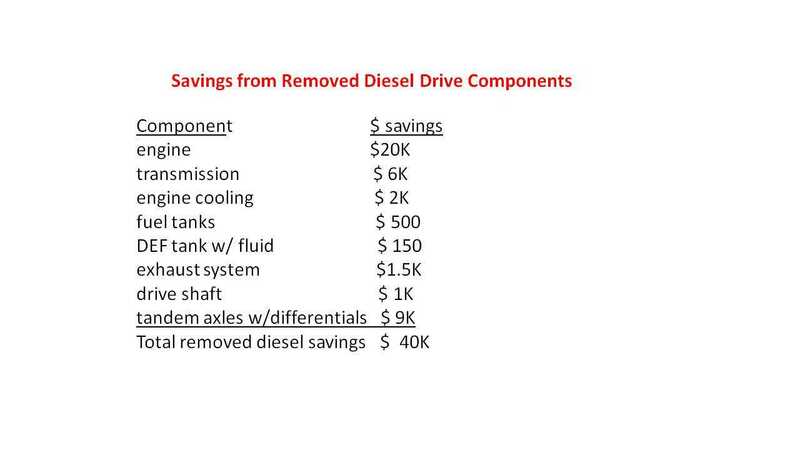 We used a recent article on present and future pack costs and re-adjusted $200/kWh down 15% for 2019 and another 15% for cost-efficiencies built into a 900 kWh pack to arrive at our $140/kWh pack cost including Thermal management system (TMS). 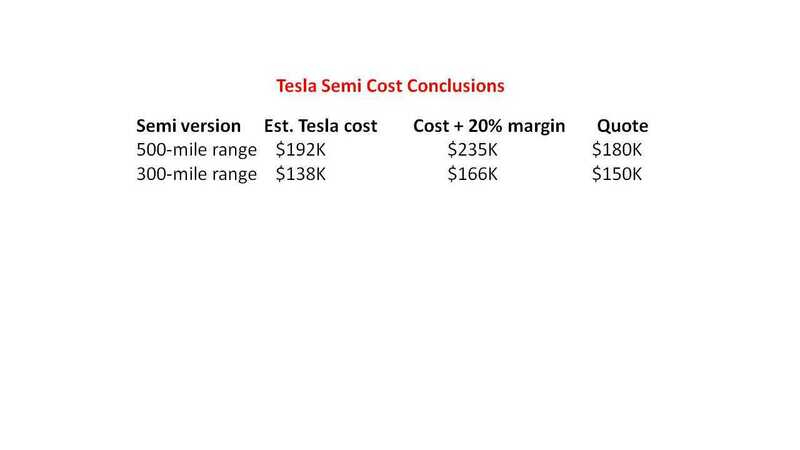 For most of the other components, we estimated Tesla’s cost based on the fact they are mass-produced Model 3 components and what their proportion might be in a typical Model 3’s actual cost. 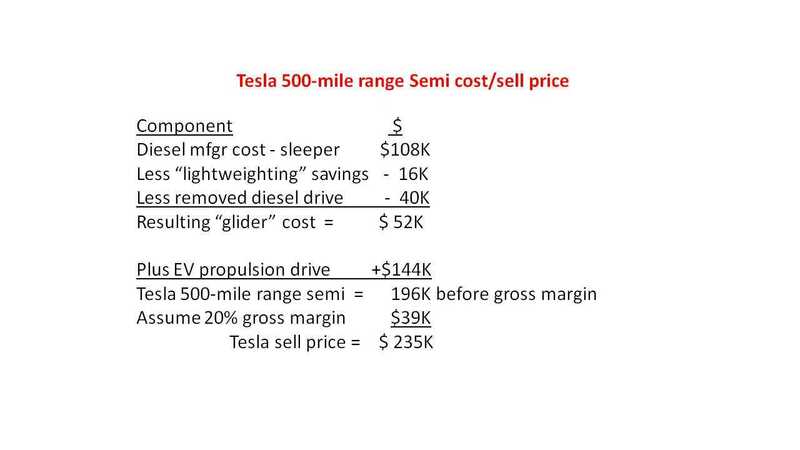 500-mile-range Semi - with the electric propulsion system with battery @ $144,000 + $52,000 for the “glider,” Tesla’s raw cost is $192,000 – BEFORE any gross margin added. With 20% gross margin added, the minimum profitable “sell price” adds up to about $230,000. 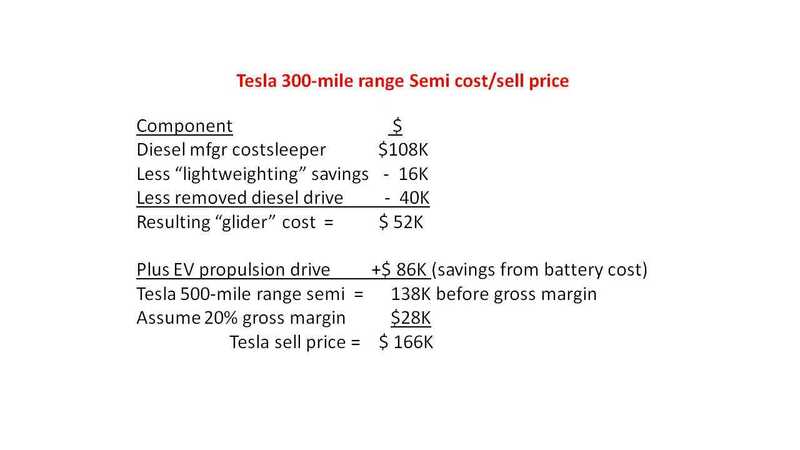 300-mile range Semi - with the electric propulsion system with battery @ $86,000 + $52,000 for the “glider,” Tesla’s raw cost is $138,000 – BEFORE any gross margin added. With 20% gross margin added, the minimum profitable “sell price” adds up to about $166,000. The 500-mile Semi: Tesla definitely can build a semi that delivers the power and the range they have claimed. For cost, we were very generous at estimating they could build a 500-mile-range pack with current or near-future battery and cell technology @ 140/kWh, but Tesla’s $196K cost is just too high. Tesla will take a loss at the “starting at” $180K price. 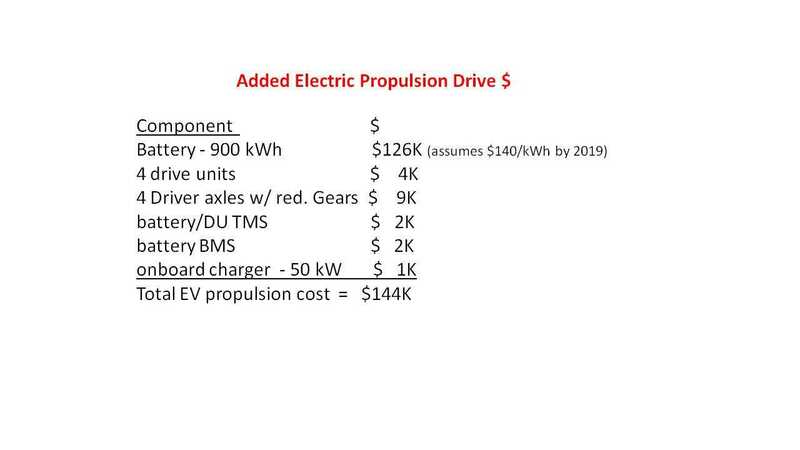 To hit a 20% gross margin, Tesla’s total costs would have to $150K, but the electric propulsion drive costs alone are $144K. That leaves NOTHING to cover the entire “glider” cost. They must bring battery pack costs down another $35K to under $100K or adjust their selling price. The 300-mile Semi: Assuming the 300-mile version is essentially the same as the long-range version other than battery size, it is more price-competitive. 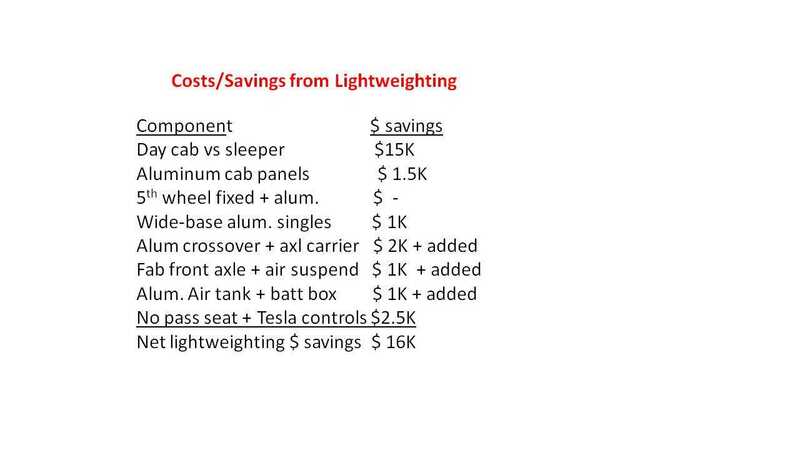 Tesla’s $138K cost, but it only gives a 9% gross margin at the “starting at” $150K price. Tesla needs to get the price down another $13K to hit 20% margin*. Because the 300-mile version price is closer to achieving a viable profit margin and more conducive to lower charge rates and distribution center charging, we predict this will be the first one Tesla releases for production and accepts production orders for. The 500-mile version will remain in concept-form until battery costs drop to $100/kWh at the pack level. *Note that Tesla brought out two semi’s at the reveal and we’ve seen two driving around on videos. The black one is a “short cab” version and may be targeted for local-haul beverage distribution, which frequently has lower trailer heights. Local haul would also be more conducive for 300-mile range batteries. The short cab version would be even lighter and might have a less expensive “glider” construction, helping lift the gross-margin with less battery-cost-reduction. *George Bower contributed to this article.